This document allows students to write in their custom schedule to allow them to quickly reference their classes for any of our seven daily schedules. This PDF can be printed or downloaded into Notability. This document includes the latest schedules Cathedral will be on for the spring semester of the 2018-19 school year. If there are any changes to the schedule we will update this link. A thoughtfully designed school schedule can have a great impact on reducing stress, enhancing programs, and increasing effectiveness in teaching and learning. We do so much well at Cathedral, and this schedule, tailored specifically for our institution, will help us to be even more effective with our use of time and will help provide increased opportunities for varied pedagogical instruction, collaboration, and advising. Fewer Transitions: The schedule was designed with research-based principles in mind. Independent School Management (ISM), a leader in this field, has compelling evidence about how a schedule can affect learning. For instance, multiple sources indicate that when a student moves from class to class there is an average transition time of 12-13 minutes per class for a student to arrive, settle in, get ready to learn, and then prepare to leave class. Limiting the number of transitions, which also reduces passing time, adds more than 60 minutes of more effective time to each day. Fewer Classes per Day: Limiting the number of classes that meet each day has advantages as well. Reducing the frequency of needing to “change hats” reduces stress and increases learning. The same is true for the evening as well as the school day. If a student currently has homework in 5-6 courses per night, that number will drop to 3-4. The amount of total work might remain the same, but not needing to “shift gears” as frequently will help focus and learning. The number of assessments (e.g., tests, papers, projects) will similarly be reduced each day. Benefits of Rotating Classes: The effects of rotating when classes meet have also been studied well. Not surprisingly, individual students and teachers naturally have different “sweet spots” in their days when they are more able to be engaged, or be engaging. Rotating the daily schedule helps to ensure that each student and each teacher is able to experience those times in every course. Time of Day Makes a Difference: Additionally, studies have shown that for certain disciplines, the time of day students study those subjects makes a difference. An Air Force Academy study provided compelling evidence that students learn math and science better at certain times of the day than another. Since we cannot have all of our math and science courses at the same time of day, rotating them makes good sense. Longer Class Periods Provide Opportunities for Varied Learning: The length of class periods has been an often-debated issue and a tremendous variety of options exist for study. ISM argues that class lengths of less than 40 minutes are too ineffective to be considered “learning days." Beyond that, what works best in each institution often depends upon philosophy and perspective. We have chosen to have each course meet five times in a 7-day cycle, with all periods meeting for the same length of time, fifty-five minutes. This permits continuity of contact while at the same time providing opportunities for more varied pedagogical techniques that work well in longer periods. Incorporating Non-Teaching Time: One of the most important features of our schedule is incorporating non-teaching time into the structure. Currently, about one-third of Cathedral’s school days are special schedules with shortened classes. 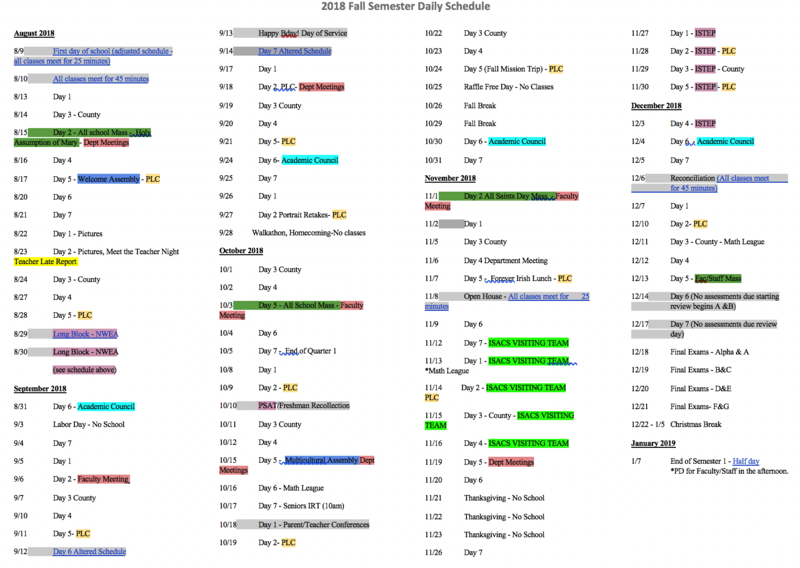 The reasons for these schedules (i.e., masses, assemblies, testing, etc.) are important and the new schedule will include these events without needing to shorten class periods. Additionally, more time will be available for our county meetings, effective education, class meetings, special seminars or guest speakers, club meetings, class meetings, in-depth study, collaboration, and unstructured time. More Flexibility: With Cathedral’s schedule, our students will have the benefit of a more flexible schedule, the option for in-depth learning, and the opportunity to learn to make good use of their time – all in a less hectic, less stressful environment. The academic schedule is comprised of eight course sections, permitting students to take the same courses and resources that were available to them previously. Over a seven-day cycle, classes will meet five times, for fifty-five minutes each. Seven of the eight course periods will rotate throughout the days of the cycle. The first period, known as Alpha Period, will not rotate and will occur at the beginning of each Day 1, Day 3, Day 4, Day 6, and Day 7 for programmatic reasons. Lunch will occur at some point during the longest block in the middle of the day. The use of the FLEX blocks is “flexible” for masses, assemblies, county meetings, and other activities.